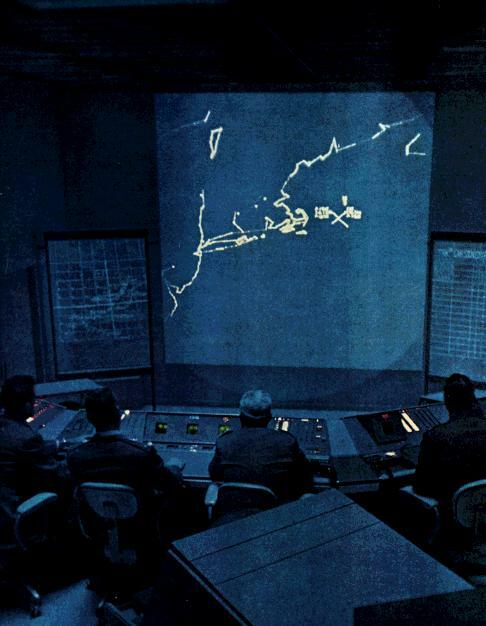 Much of the research conducted at MIT by Chomsky and his colleagues [has] direct application to the efforts undertaken by military scientists to develop … languages for computer operations in military command and control systems. Defense of the continental United States against air and missile attack is possible in part because of the use of such computer systems. And of course, such systems support our forces in Vietnam. … Command and control systems would be easier to use [if artificial computer languages] were not necessary. We sponsored linguistic research in order to learn how to build command and control systems that could understand English queries directly. The most ambitious effort to construct an operating grammar is being made by a group at MITRE, concerned with English-like communication in command and control computer systems. It is no accident that Noam Chomsky, the major theorist in all of American linguistics, is located at MIT. As many as ten MIT linguistics worked on this MITRE project and two of them have confirmed to me that Chomsky did indeed visit MITRE in his consultancy role, at least in 1965. This official history also refers to MITRE’s key role in creating the so-called McNamara line – a huge barrier of sensors, mines and cluster bombs along the border between North and South Vietnam. It was Jerome Wiesner who helped initiate this infamous project. Wiesner is important because he was the lab director who first recruited Chomsky to the Research Laboratory of Electronics in 1955, who co-founded MIT’s linguistics program in 1961 and who, as MIT’s Provost and then President, was in effect Chomsky’s boss for over 20 years. Having brought nuclear missile research to MIT, Wiesner then became President Kennedy’s chief science advisor in 1961, from which position he insisted that nuclear missile development and procurement “must all be accelerated”. Wiesner later became more critical of the unrestricted stockpiling of nuclear weapons, particularly those equipped with multiple warheads. But this change of heart did not stop him from administering MIT laboratories dedicated to research on just such developments. As MIT’s Provost and President, he also oversaw research into helicopter design, radar, smart bombs and counter-insurgency techniques for the ongoing war in Vietnam. This illusion of freedom was strengthened by the fact that, in order to secure generous funding from the Pentagon, MIT's scientists would themselves come up with reasons why their research had military applications. Some scientists, no doubt, then convinced themselves that they were tricking the Pentagon into investing in research of real value to humanity. Yet precisely who was tricking who remains an open question. As long as a reasonable percentage of the research sponsored by the Pentagon turned out to be militarily useful, why should the Pentagon care what these scientists thought they were doing? We were as free as birds. … I never had any whiff of military work at MITRE. … What we talked about had nothing at all to do with command and control or Air Force or anything similar. We had total freedom. Everybody could choose their own topic, as long as it could be related to the goal of eventually getting machines to process English sentences and do some question-answering on topics of potential interest to the Air Force. Clearly, Partee has some doubts about this rationalization, perhaps rightly. In 1971, the Pentagon’s representatives insisted that the Defense Department had to date made “a very thorough effort” to ensure that it funds “only research projects directly relevant to the military’s technological needs.” And, when exhaustively checked at the time by a group of anti-militarist academics from Stanford University, this claim was found to be accurate. On the other hand, maybe Partee is right. After all, none of Chomsky’s linguistic theories from this period ever really worked, so all the money the Pentagon spent was, in fact, wasted from their point of view. But what if his theories had worked? The authors of the MITRE papers that name Chomsky as a “consultant” are quite clear that their project was about the “development of a program to establish natural language as an operational language for command and control.” So what if this MITRE project had been successful? Wouldn’t that have led to a situation in which whenever a US commander targeted a village in a counter-insurgency operation – or targeted an entire city during a nuclear war – that commander would be unleashing death and destruction thanks to linguistic theories inspired, initially, by Chomsky himself? Based on such comments, it is hard to know what Chomsky was really thinking during his time at MITRE. But we can make inferences from what he did after his time there, after 1965, when he appears to have resolved never again to work directly on a military project, instead committing himself publicly to anti-militarist activism. Up until the mid-1960s, Chomsky was relatively quiet about his political views. Partee recalls: “I never heard him say a political word in any linguistics class,” while Ross told me: “At MITRE I had never had the slightest hint about Noam’s radicalism.” But, as is well known, from 1965 Chomsky threw himself into resistance against the war in Vietnam. As part of this activism, Chomsky advocated the “avoidance of work that can be used by the agencies of militarism.” He also gave considerable thought to “resigning from MIT, which is, more than any other university, associated with activities of the Department of ‘Defense’.” But MIT’s managers had treated him particularly well, making him associate professor at the age of 29 and a named professor at 37. And, as Chomsky says, this named professorship, which he received in 1966, “isolated me from the alumni and government pressures.” Consequently, he was now in the rare situation of being free to be an outspoken anti-militarist while still working for one of the US’s most prestigious military labs. Such a situation had many advantages, including the fact that such proximity to the US’s military and scientific elite gave his criticisms of that elite a unique authority. But to be the Pentagon’s No.1 critic while remaining loyal to the Pentagon’s No.1 university was never going to be straightforward. It led Chomsky to take a variety of contradictory positions on events both at MIT and in the wider world. Commentators have usually seen Chomsky’s attitude to war research as just an example of his uncompromising commitment to academic freedom. But we can now see such comments in a different light, as an attempt by Chomsky to come to terms with his own early career decisions at MIT. The same might be said of Chomsky’s defense of Robert Faurisson, the French academic who was deprived of his teaching job after he wrote a book denying the Holocaust. Clearly Chomsky has never had any sympathy with Holocaust denial. But if academics should be free to produce work that enables the military to “murder and destroy,” why shouldn’t they also be free to promote Holocaust denial? Naturally, having argued that people like Rostow and Faurisson should be able to work in academia, Chomsky was in no position to be too hostile to any of his colleagues at MIT, no matter what they were up to. In the 1980s, for example, MIT’s most notorious academic was its Provost, John Deutch, who was particularly controversial due to his role in bringing biological warfare research to the university. Deutch was also heavily involved in the Pentagon’s chemical weapons strategy, its deployment of MX nuclear missiles and its Nuclear Posture Review of 1994. By this point, student and faculty opposition meant that Deutch had failed in one of his ambitions – to become President at MIT – but he had succeeded in becoming Deputy Defense Secretary. Then, in 1995, President Clinton made him Director of the CIA. We were actually friends and got along fine, although we disagreed on about as many things as two human beings can disagree about. I liked him. … I had no problem with him. I was one of the very few people on the faculty, I’m told, who was supporting his candidacy for the President of MIT. One of Chomsky’s most controversial political positions concerned Pol Pot’s regime in Cambodia. Although he never denied that the regime committed atrocities, it is hard to read his early writings on this subject without getting the impression that he is understating what was going on in Cambodia under Pol Pot. Chomsky’s right-wing detractors have implied that this was because he had some ideological sympathy with the Pol Pot regime. This was clearly not the case. A better explanation is that it pained Chomsky’s conscience to be too critical of any country that had been so brutally targeted by the Pentagon, i.e. by the same people who had so generously funded his own academic career. Now, I am not saying that Chomsky’s conflicted relationship with his military employers was the only factor in these various political positions. After all, the left has always been divided on its attitudes to student protests, academic freedom and Third World nationalism, along with many other issues. But, in my opinion, you cannot understand Chomsky’s more controversial standpoints without taking account of his institutional situation at MIT. This applies in particular to his ideas about the nature of human language. Anyone who has investigated Chomsky’s linguistics will know that he is not really interested in the way English or Russian are used by its speakers. Instead, he has always been concerned with something called “Universal Grammar” – a concept which has become increasingly vague and abstract with the passing of time. My own explanation for this is that after his early experiences at MIT and MITRE, he only felt comfortable when developing models so utterly abstract and ideal – so effectively immunised against social or engineering applications – that no one could possibly make use of them for anything practical at all, let alone for killing people. So, according to Chomsky, language is no more designed to facilitate communication than your legs, clothes or hair! Chomsky’s ideal is to make linguistics rigorously formal, on the model of pure mathematics or philosophical logic. Such a view of language has many disadvantages but one big advantage. You cannot kill people with philosophical logic. Most readers of this article probably take it for granted that language must have evolved under natural selection to meet our ancestors’ material needs. Most would assume that language must have something to do with history, politics and culture, and that children acquire their first language by learning from those around them. So, to many of Chomsky’s admirers, it comes as a shock to discover that he completely rejects every one of these ideas. He suggests, for example, that the biological capacity for language did not evolve through natural selection but, rather, that the brain of a single early human was somehow “rewired, perhaps by some slight mutation”. He then makes the even stranger claim that the concepts we put together in sentences – for example “book” or “carburettor” – are genetically determined items which existed in the human brain from the very beginning, millennia before real books or carburettors had even been invented. These ideas simply make no sense. But there has to be a reason why Chomsky so passionately espouses them. I am not claiming any privileged access to Chomsky’s psychology but what I can say is that such strange ideas categorically remove linguistics from all contact with the real world, situating the entire field in a realm of eternal abstractions. While this successfully removes linguistic theory from any dubious military use, it also means, unfortunately, that none of it really works. Let me say here that although Chomsky remains a hugely influential figure, the military were not alone in concluding that no part of his theoretical system could ever be made to work. The celebrated concept of ‘deep structure’ had to be abandoned long ago, along with virtually every other concept of the early years. Many linguistics would agree that almost none of Chomsky’s detailed claims about the nature of language has survived the test of time, a point candidly conceded by Chomsky himself. For anyone in my position as a lifelong activist, it feels risky to say things that can so easily be misunderstood. No part of my account can detract from Chomsky’s record as a tireless anti-militarist campaigner. Neither can it detract from his persistence in withstanding the institutional pressures that he must have endured at MIT. Had he resigned in disgust in 1967, when he was thinking of doing so, he might never have gained the platform he needed to signal his dissidence across the world. There are times when all of us have to make compromises, some more costly than others. My argument, as I explain in more detail in my book, is that it was Chomsky’s linguistics rather than his activism that bore the brunt of those damaging pressures and costs. Chris Knight is author of Decoding Chomsky: Science and revolutionary politics, Yale 2018. 1. Arnold Zwicky, ‘Grammars of Number Theory: Some Examples’, Working Paper W-6671, MITRE Corp., 1963, Foreword, last page; Arnold Zwicky and Stephen Isard, ‘Some Aspects of Tree Theory’, Working Paper W-6674, MITRE Corp., 1963, Foreword, last page; Allen Newell in George Bugliarello, ed., Bioengineering: An Engineering View, 1968, p. 271. 2. Personal communication from Barbara Partee to the author, 8 February 2018. 3. Geoffry White, Campus Inc., 2000, p. 445. 4. Anthony Debons, ‘Command and Control: Technology and Social Impact’, Advances in Computers, vol. 11, 1971, p. 354. 5. Frederick Newmeyer, The Politics of Linguistics, 1986, pp. 85–6. 6. Samuel Jay Keyser, Mens et Mania: The MIT Nobody Knows, 2011, pp. 16–7. 7. Samuel Jay Keyser, ‘Linguistic Theory and System Design’ in Joseph Spiegel and Donald Walker, eds, Information System Sciences, 1965, pp. 495–505. 8. Newell in Bugliarello, Bioengineering: An Engineering View, p. 271. 9. Antonio Zampolli, et al., Current Issues in Computational Linguistics: In Honour of Don Walker, 30 June 1994, pp. xxi–xxii; Personal communication from Arnold Zwicky and Barbara Partee, February 2018. 10. Robert Meisel and John Jacobs, MITRE: The First Twenty Years, A History of the MITRE Corporation (1958-1978), 1979, pp. xiii, 16–9, 59, 65, 114–5. 11. New York Times, 2 July 1971, p. 12. 12. Robert Barsky, Noam Chomsky, A life of dissent, 1998, p. 86; ‘Scientific Reunion Commemorates 50 years of Linguistics at MIT’. 13. Naval Research Reviews, July 1966, p. 4. 14. Chicago Tribune, 29 June 1969, p. 24. Jerome Wiesner was also involved with the US’s Cold War strategies of ‘political warfare’ and ‘psychological warfare’. In 1958, he even suggested that ‘Marxism’ could be countered by presenting the US as a ‘classless society’, one which had already accomplished what ‘the communists have claimed as their goals’. Wiesner, however, probably achieved more to subvert Marxism in 1953 when his representative, Roman Jakobson, organised influential seminars in Paris whose contributions to philosophy were later to evolve into postmodernism. UCLA Historical Journal, no. 10, 1990, p. 18; Robert Rydell, World of Fairs: The Century-of-Progress Expositions, 1993, p. 198; Bernard Geoghegan, ‘From Information Theory to French Theory: Jakobson, Levi-Strauss, and the cybernetic apparatus’, Critical Inquiry, vol. 38, Autumn 2011, pp. 111–13, 118–19, 124–6. 15. Jerome Wiesner, Report to the President-Elect of the Ad Hoc Committee on Space, 1961. 16. Science, no. 3924, 13 March 1970, p. 1475; Technology Review, June 1970, p. 82. 17. Michael Albert, Remembering Tomorrow: From the politics of opposition to what we are for, 2006, pp. 97–9. 18. Daniel Greenberg, The Politics of Pure Science, 1999, pp. 132, 151. 19. Colm Renehan, Peace Activism at the Massachusetts Institute of Technology from 1975 to 2001: A case study, PhD thesis, Boston 2007, pp. 247, 106. 20. Barbara Partee, ‘Reflections of a Formal Semanticist as of February 2005’, p. 8n; Personal communication to the author, 8 February 2018. 21. Stanton Glantz and Norm Albers, ‘Department of Defense R&D in the University’, Science, no. 4165, 22 November 1974, pp. 706, 710-11; Science, no. 4189, 16 May 1975, pp. 678–83. 22. Zwicky, ‘Grammars of Number Theory’, Foreword, last page; Zwicky and Isard, ‘Some Aspects of Tree Theory’, Foreword, last page. 23. ‘Chomsky’s Carburetor’, Cited Podcast, no. 23, 2016. 24. White, Campus Inc., pp. 445–6. 25. Noam Chomsky, American Power and the New Mandarins, 1969, p. 8. 26. Noam Chomsky, ‘Letter’, New York Review of Books, 23 March 1967. 27. Barsky, Noam Chomsky, p. 3; The Tech, 22 April 1966, p. 1; ‘Noam Chomsky – The War on Unions and Workers Rights’, YouTube 1995, 2 hours 2–5 mins. 28. Joel Segel, ed., Recountings: Conversations with MIT mathematicians, 2009, pp. 206-7. 29. Barsky, Noam Chomsky, p. 141; Milan Rai, Chomsky’s Politics, , 1995, p. 131. 30. Barsky, Noam Chomsky, pp. 179-86. 31. The Thistle, vol. 9, no. 7; The Tech, 7 March 1989, p. 2 and 27 May 1988, pp. 2, 11. 32. Chemical and Engineering News, vol. 60, no. 1, February 1982, pp. 24–5; Brent Scowcroft, Report of the President’s Commission on Strategic Forces, 1983, frontispiece, pp. 20–1; Bulletin of the Atomic Scientists, January 1995, p. 31. 33. Noam Chomsky, Class Warfare: Interviews with David Barsamian, 1996, p. 101. 34. New York Times, 10 December 1995. 35. Noam Chomsky and Edward Herman, After the Cataclysm: Postwar Indochina and the Reconstruction of Imperial Ideology, 1979, ch. 6. 36. Noam Chomsky, On Nature and Language, 2002, p. 76. 37. Noam Chomsky, ‘Three factors in language design,’ Linguistic Inquiry, vol. 36 no.1, 2005, pp. 11-12. 38. Noam Chomsky, New Horizons in the Study of Language and Mind, 2000, pp. 61, 64-6; Chris Knight, Decoding Chomsky: Science and revolutionary politics, 2018, ch. 18. 39. Paul Ibbotson and Michael Tomasello, ‘Evidence Rebuts Chomsky’s Theory of Language Learning’, Scientific American, 7 September 2017; Chomsky, On Nature and Language, p. 151. Noam Chomsky: Politics or Science?